WE ARE SORRY TO SAY THAT THIS PROGRAM, SCHEDULED FOR THIS EVENING, THURSDAY, FEBRUARY 23RD, HAS BEEN CANCELED DUE TO THE IMPENDING BLIZZARD. PLEASE STAY SAFE. experience two Ugandan street treats. a brittle made with coconut, cardamom, and peanuts. 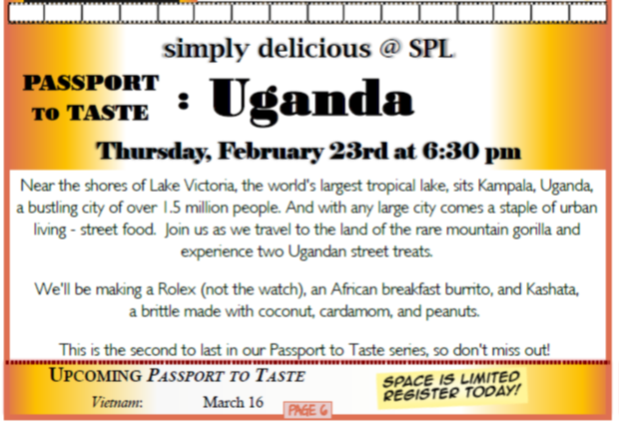 This is the second to last in our Passport to Taste series, so don't miss out!